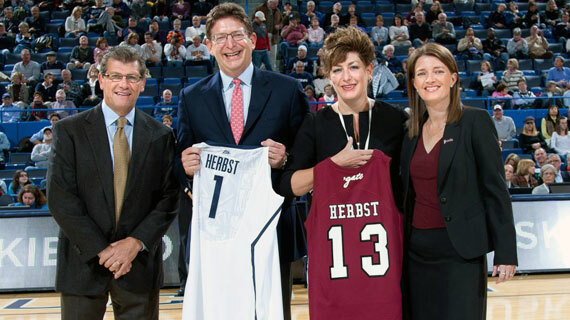 UConn Coach Geno Auriemma, Colgate President Jeff Herbst, UConn President Susan Herbst, and Colgate Coach Nicci Hays Fort (left to right) pose for a photo at center court. There was a good-natured sibling rivalry on display at center court before the game and some competitive flashes on the court during the women’s basketball game between the Colgate Raiders and Connecticut Huskies on Wednesday night in Hartford, Conn.
Colgate University President Jeffrey Herbst and his sister, Susan Herbst, who is president of the University of Connecticut, exchanged handshakes, traded jerseys, and posed for pictures before the opening tip with Raiders head coach Nicci Hays Fort and the Huskies’ Geno Auriemma. Nearly 150 Colgate boosters gathered for a standing-room-only pre-game reception, enjoying the atmosphere at the XL Center in Hartford. The Raiders players knew it would be a challenging night against the Huskies, the perennial powerhouse that is ranked No. 2 in the nation. 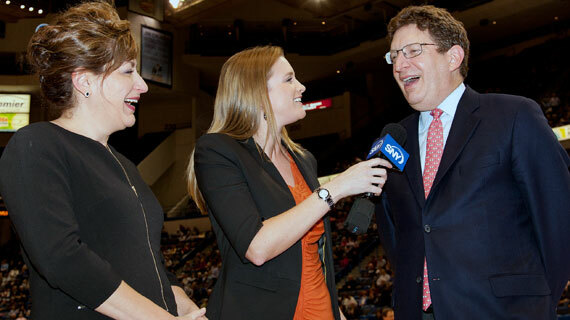 UConn ended up winning 101-41.
Colgate President Jeffrey Herbst and his sister, UConn President Susan Herbst, were interviewed by an SNY network reporter.